I had arranged to go fishing with Nigel early last Saturday morning. We met in the cliff-top car park at 4am for a plugging session.The sea was calm and the water was clear so we tackled up with shallow diving plugs and began to spin for bass. 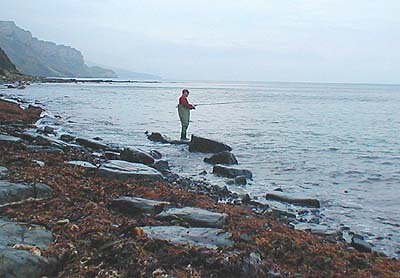 After half-an-hour or so nothing was forthcoming and it was pretty light so I suggested that we forget the bass and try for a few wrasse. In fact we did not need to change the lures but we walked around the headland to fish a different spot which we knew from past experience was likely to produce ballan wrasse. The tide was well up by the time we started fishing. We were in an angle of the shore next to a ledge which ran out to sea at right angles to the shoreline. The water was about a metre deep and in front of us the ground consisted of flat rock littered with boulders and cobbles decorated with patches of bladder wrack and serrated wrack. 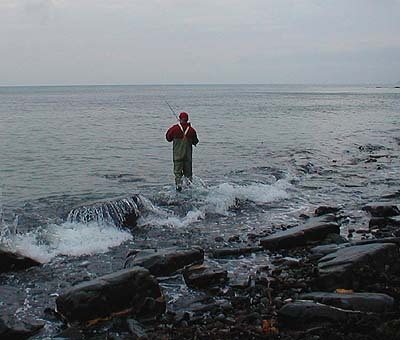 In fact the particular spot can be a bit of a tackle graveyard but it is a very consistent fish producer. By far the most common catches at this place are wrasse but I have taken garfish, squid, bass, pollack and mullet in the past, even though it is very shallow. It was not long before Nigel gave a shout and I looked up to see that he was into a fish. 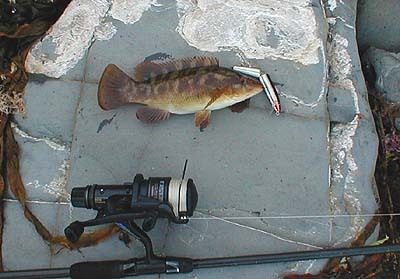 Typically, after a couple of strong runs the wrasse began to tire and after a couple of minutes it was on the shore. 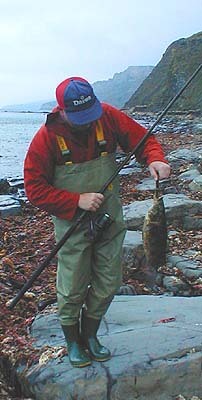 After unhooking the fish Nigel decided to weigh it, commenting that they were "never as heavy as they looked." However, this one proved to be 1.7kg (three-and-threequarter-pounds) his best, so far, on a plug. In fact fish of almost twice that weight are a definite possibility along this part of the Dorset coast. After Nigel had returned his fish I felt a pluck, pluck, pluck as I retrieved but, although I continued to reel in steadily, the fish was not hooked. Five minutes later I landed a wrasse a bit smaller than Nigels and then one which was much smaller. The significant thing is that even on the fairly light spinning tackle none of the fish looked like hanging us up on the seabed. I can guarantee that fishing with bait in the same place would at least produce a few tug-of-war battles to extract the fish from their hidey holes. 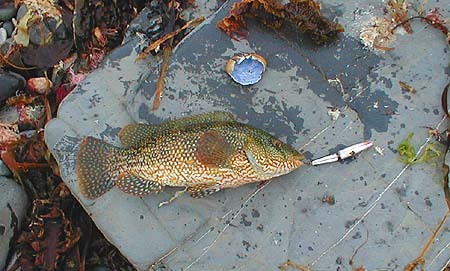 Of course , if you want to catch lots of wrasse you would be well advised to use bait. Worms if you want numbers and hard crabs if you want to pick out the bigger fish. 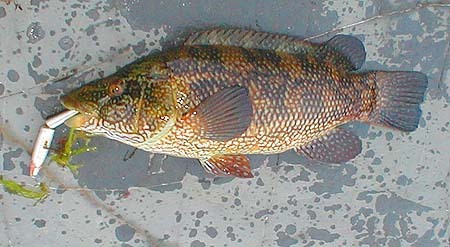 Nevertheless, plugging is a productive and exciting way of catching wrasse which, on the whole, avoids the tiresome business of losing tackle and leaving hooks in small fish. Of course there are the added bonuses of catching other predatory species and of learning more about the location of fish that you see but don't catch. My first wrasse of the session.